I went to Designing Jewelers with little design guidance for the Designing Jewelers team, but I knew I wanted a “pretzel twist” in the band. 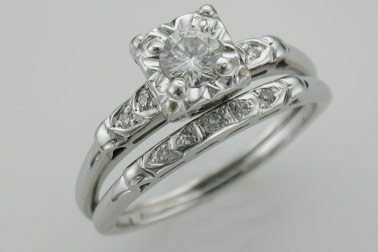 Al and Brenda’s approach and guidance allowed me to quickly become comfortable with designing Kristina’s ring. From the idea to the design, it was a natural fit. 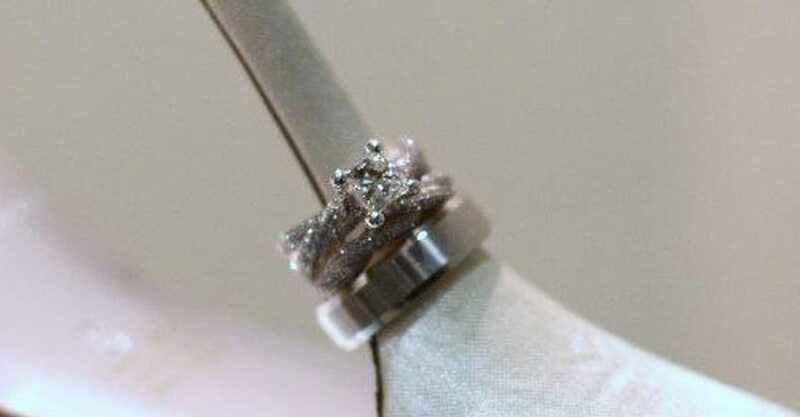 Al and Brenda listened to my ideas and walked me through the process to find the perfect ring. They highlighted a few designs and one was exactly what I wanted! Kristina and Jared had been dating since junior year of high school. However, if you count the crush Kristina had on Jared in junior high, the couple’s moment down the aisle had been set in motion over a decade before Jared walked into Designing Jewelers. Jared, Kristina, family and friends all expected the two would wed, but Jared wanted to make sure their engagement was the ultimate surprise. To accomplish this, Jared bravely entered the quest to buy an engagement ring for Kristina on his own. Proposal plan #1 was a 4th of July picnic. With the ring in hand, Kristina thwarted Jared’s plan by making last-minute plans with friends. Having to bide his time until he could devise plan #2, Jared spent the night laughing off playful engagement jokes from friends. Little did they know, Kristina’s ring was burning a hole in his pocket. Jared’s second attempt was a success. He proposed at the Freighthouse Restaurant in La Crosse as the couple celebrated a new job for Kristina. Jared and Kristina’s story continues to be written, and now includes a daughter and son. 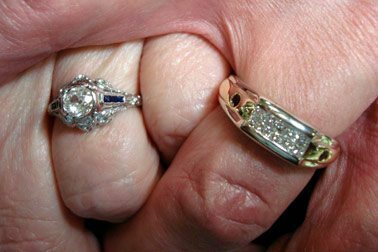 At Designing Jewelers, we are honored to participate in helping memorialize special “life moments” such as these. Jared came to Designing Jewelers with confidence that Kristina should be his wife, but had questions about how to create an engagement ring that would be exactly what Kristina would love.